Compass Youth: ONLY A FEW HOURS BEFORE LOVE DIFFERENCE! ONLY A FEW HOURS BEFORE LOVE DIFFERENCE! As the event is on Sunday, we thought we'd give you the chance to wake up late, so come down to Cargo at 1pm when we kick off the day. To get there, check this map. The nearest tubes are Old Street & Liverpool Street or you can call 02077393440 for enquiries on how to get there. 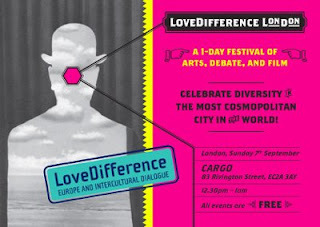 The LoveDifference event has received amazing coverage by the media. Not only have we been featured by the Evening Standard, London Paper, Metro, Total Politics and Timeout but a range of blogs and magazines. Around 100 people have confirmed so far which is far more than we expected, but we say the more the merrier so invite your friends down and join us for a fantastic event. It's may be raining tomorrow, so what better way than to take refuge in one of the coolest venues in London and check out the politics, videos and live music and you can even grab some grub and drink there. We will also be launching our first ever toolkit to help you campaign for the issues that matter to you. Media coverage also includes Angel & North, Bulgarian Parties, Cargo, Congoo, Emito, Ethnic Multicultural Media Academy, Ethnic Now, Europe in the UK, Everyday Social Democracy, Global Music Culture, Intercultural Dialogue, Labour Home, Last FM, Liberal Conspiracy, Live Music, London Net, Macadam, Move Avenue, MyVillage, Music Unsigned, Newer Labour, One World, Pohby, Polish Culture, Subba Cultcha, Total Politics, Virtual Festivals, Visit London, Wiadomosci and Youth & Migration. TAXUAL HEALING - TIME FOR TOBIN? SCREEN THE FILM, PIN THE PITS! 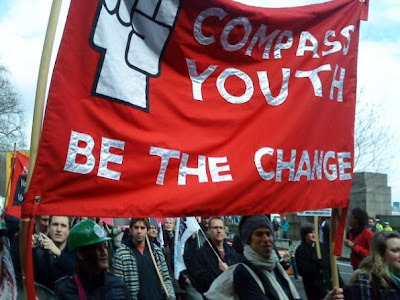 COMPASS YOUTH ON TOUR - NEXT STOP NORTHAMPTON! COME AND SEE "KATE AND MRS JONES"